To design and implement an algorithm which, given the inputs of work cost, backlogs, and tasks for multiple servers, produces an output of work distribu- tons (loads) for all servers and tasks in the system such that the timespans are minimal and, if possible, balanced. That is, the algorithm finds the optimal distribution for M tasks and N servers. The project focuses on an algorithm for three server load balancing, and then attempts to generalize the algorithm to four and five servers. The system being considered consists of multiple servers represented as rows of a matrix, and multiple tasks, represented as columns of a matrix. Backlogs indicate the amount of work already being handled by a given server. Time spans indicate the run time associated with running several tasks on a server. Tasks can be of any type of work; however, the algorithm is conceptually focused on multi- media tasks. The data initially has been provided as integers. The system is mathematically modeled as a system of linear inequalities, therefore it is a member of the “Linear Programming” class of problems. This problem bears similarity to “The Classical Transportation Problem”, from this, one knows that the “basic solution” requires no more than m+n−1 variables. D3 + N ≤ T2 − W2K (X ). That is, the N’th server should have a timespan less than or equal to the existing 1 to N-1 servers previously balanced. The algorithm does not proceed to consider the next server if its timespan is already greator than the balanced servers. values of for the new loads. The approach that this author chose was to set the equations equal to each other, and then to “combine like-terms” thereby producing a constants vector and a matrix of coefficients for each variable. The system is subsequently solved for each variable4. The system; however, is correctly modeled via an inequality, not an equal- ity. Therefore, simply computing values for the variables introduced does not alone solve the system. The algorithm needs to consider the constraints placed on the variables in the system so that the property of “non-negativity” is enforced. This implementation uses a constraints vector for which the val- ues of solutions cannot be exceeded. 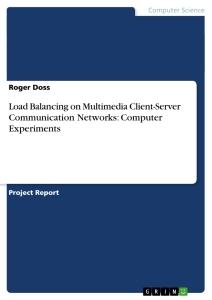 If a constraint is violated, the newly introduced load is assigned the entire load5 and the remaining servers are re-balanced so as to maintain equilibrium at all stages. Failing to rebalance the servers produces errant results. Table 4: Increasing all w(j,3):=w(j,3)+1. Table 5: Increasing all jobs b(j):=2b(j). Table 6: Increasing all w(j,2):=w(j,2)+2. Table 7: Increasing all delays d(k):=2d(k). Table 8: Increasing all w(2,k):=w(2,k)+3. Table 9: Solving the Generated Problem. Table 10: Increasing all jobs b(j):=b(j)+1. Table 11: Increasing all w(j,3):=w(j,3)+1. Table 12: Increasing all jobs b(j):=2b(j). Table 13: Increasing all w(j,2):=w(j,2)+2. Table 14: Increasing all delays d(k):=2d(k). Table 15: Increasing all w(2,k):=w(2,k)+3. Table 16: Solving the Generated Problem. Table 17: Increasing all jobs b(j):=b(j)+1. Table 18: Increasing all w(j,3):=w(j,3)+1. Table 19: Increasing all jobs b(j):=2b(j). Table 20: Increasing all w(j,2):=w(j,2)+2. Table 21: Increasing all delays d(k):=2d(k). Table 22: Increasing all w(2,k):=w(2,k)+3. 1 The information presented here was derived in part from the class Lecture. The author of this document is presenting it here for completeness. It is not intended that the reader view this as the author’s work, but rather as reference material, which originated from the class lecture. It is therefore approperiately cited as such. 2 This is always possible initially due to the state of the system after the two initial servers have been balanced. 3 The load that should already exist must be in a row other than that where the algorithm performed a decrement. This allows the previously balanced servers to be decre- mented simoultaneously. 4 The technique used to solve the systems of linear equations was Gaussian Elimination, though this is not the only way. 5 This is a pecularity of my implementation. One reason why the algorithm could not solve the system with a positive load is because the newly introduced server is drastically less buisy than the others already balanced. For this, it is safe to introduce the entire load to this server.